The prolific author and Catholic priest penned a moving and inspiring book inspired by his colorful life. The book affirms the power of faith over communism, a godless ideology. It is obvious to readers that Reverend Vu, through his main character Viet, narrates his multiple experiences as a young boy who endured the Viet Nam war and the atheistic communism of his country, a refugee who was one of the many boat people that escaped Viet Nam, a newcomer to America who struggled with cultural and language barriers, and a seminarian who, being human, experienced loneliness and hopelessness and even thought of suicide. Readers will be amazed and, at the same time, inspired by how Reverend Vu drew analogies between his experiences and observations in life and certain events in the Bible and the lives of Christian figures. For examples, he drew parallels between the division and infighting within the Church and the war between the houses of David and Saul (in 2 Samuel 2:8-4:12), his bargaining with God during the harrowing boat journey and Abraham’s bargaining with God, and his family allowing their only son to become a priest and Abraham offering Isaac to God. The experiences of the Anglican/Lutheran minister Richard Wurmbrand in Communist Romania will come into the mind of certain readers. The experiences of the two clergymen attested to the fact that communism only brought tears, sadness, despondence, suspicion, resentment, pain, and suffering. Reverend Vu’s book affirms the power of faith over a godless ideology. “An unusual story of human suffering and the consequential awakening of spiritual empowerment,” wrote Maddy Christopher for the San Francisco Book Review. Helen Vernier of the Manhattan Book Review gave Reverend Vu’s book four stars out of five and applauded the book for its honest and truthful take on the problems and hypocrisy of the church. 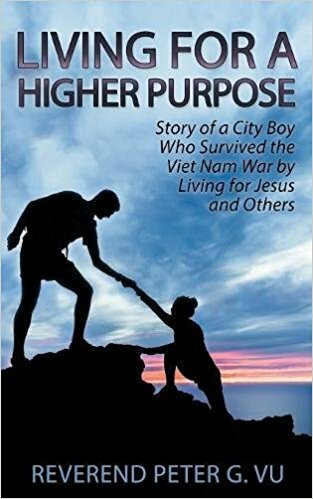 Reverend Peter G. Vu’s “Living For Higher Purpose” is available through Amazon (https://www.amazon.com/Living-Higher-Purpose-Survived-Vietnam/dp/1457558165) and the author’s website (https://www.fatherpetervu.org/book3/). Rev. Peter G. Vu has been a Catholic priest of the Diocese of Grand Rapids, Michigan for twenty years. He was born in Saigon City (currently Ho Chi Minh City), Viet Nam and was a young boy when the Viet Nam War ended. He grew up under communism and endured lots of hardship for over a decade. After high school, he snuck out by boat and came to America to start his seminary training. He attended Union High School in Grand Rapids, Michigan for one year to learn the language and culture. After studying at Aquinas College for two years while staying at Christopher House Seminary, he was sent to the University of St. Thomas in St. Paul, Minnesota for his last two years of college, where he graduated with a double major in Mathematics and Philosophy. He attended the University of St. Mary of the Lake and Mundelein Seminary in Chicago, Illinois for his graduate studies. He was ordained with the Master Degree of Divinity (MDiv) and the Sacred Theology Baccalaureate (STB). He was also trained in Clinical Pastoral Care in the Hospital and Nursing Home setting and practiced at a general hospital in Oxnard, California. Aside from serving six different churches over the last 20 years, he also served as chaplain of Grand Rapids Home for Veterans for almost 10 years.